better known as one of my absolute favorite fancy (but easy to make) salads. Whether you serve it as a luxe barbecue side, for a lovely ladies lunch, bridal or baby shower, this dish is as delicate as it is delectable. I've quiet literally observed guests tilting the serving bowl in mid air in an effort to scrape clean every last bit. Nothing makes me happier, by the way. 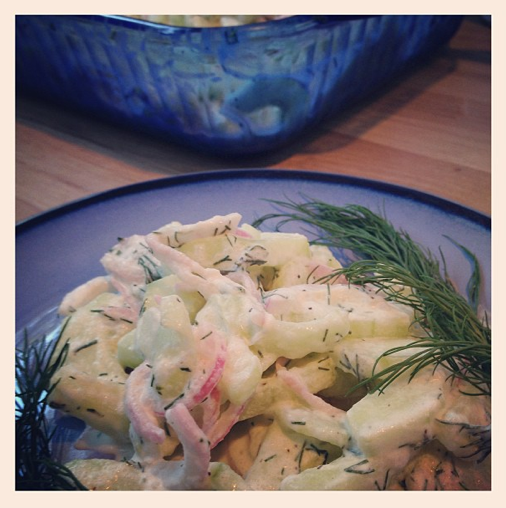 I've been making French Cucumber Salad for quite a while now. Years ago, I enjoyed a version of it at a cute little Brooklyn Wine Bar called The Castello Plan. Thanks to crisp, chilled cucumbers, I found it refreshing and light (yet slightly creamy because of the creme fraiche). Bright notes of vinegar and an ever so slight sweetness from a pinch of sugar were brought together with dill, which imparted an herbaceous freshness. Once I got home, I scoured the internet until I found a recipe that appeared the most similar to the dish I'd just experienced. 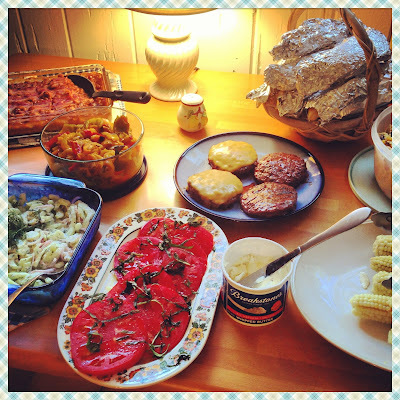 My search brought me to a wonderful food blog that I've been referring to ever since - It's called JintanManis. 1. Peel all the cucumbers leaving some thin strips of green skin. 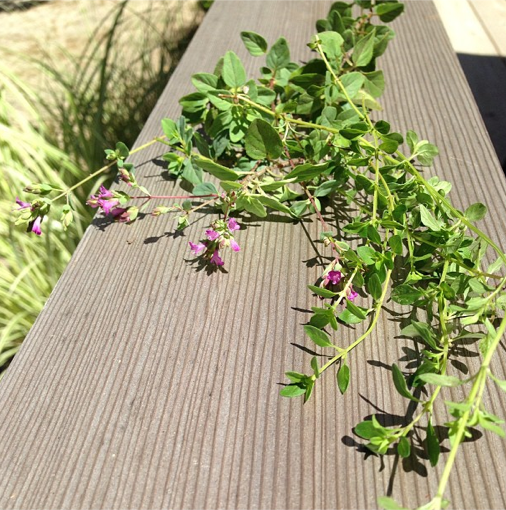 Cut them in half lengthwise and cut off and discard each of the ends. To de-seed cucumbers, drag a teaspoon down the length of the cucumber half (cut side up) until seeds are scraped out. Don’t be afraid to apply some pressure. Discard seeds. What you will be left with should look like a canoe shape. Slice the cucumbers very thinly until you have pile of little half-moons. If you have a mandoline it will make things quicker! 2. Next, mix the sliced cucumbers with the ice cubes and add enough water to reach past the surface of the cucumbers. Add 3/4 of a teaspoon of salt to the water. Mix together gently and allow the mixture to sit for 5 minutes. Drain very well. 3. 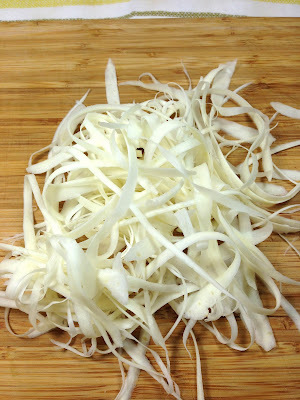 Slice the shallot very thinly and add to the cucumber. Mix in the vinegar, sugar, pepper, dill, and another 1/2 teaspoon salt. Combine well. Allow the mixture to sit at least 30 minutes, stirring occasionally. Stop here if you are making this in advance or bringing to a party. 4. A few minutes before serving, drain away all the juices. Stir in the crème fraiche or sour cream and toss very gently. You can add extra if you prefer it more creamy. Taste for seasonings and adjust if needed. To serve, spoon the salad into a shallow, pretty bowl and garnish with minced dill and dill sprigs. Labor Day is almost here and even though we have a big bash planned, we are, as always, keeping things simple. 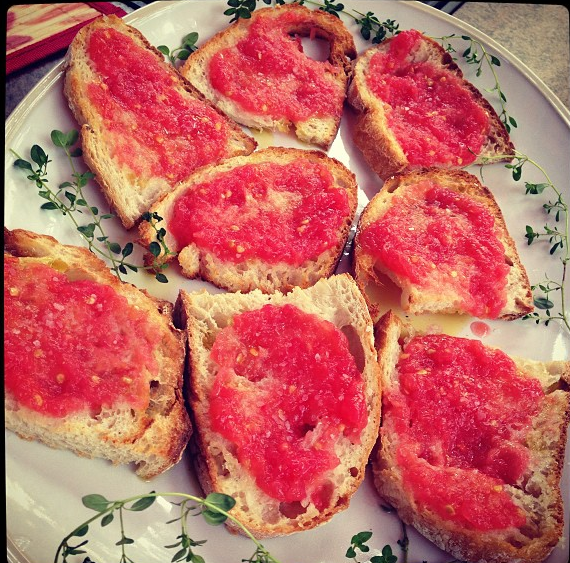 For our holiday weekend barbecue, we'll be serving up a traditional Spanish tapa to kick off our meal - Pan con Tomate. Pan con Tomate means bread with tomato, and that's really almost all there is to it. Extremely ripe tomatoes are grated into a pulp and put atop crusty slices of a toasted bread that have been liberally rubbed with garlic and drizzled with olive oil. Basic though it may be, Pan con Tomate also happens to be insanely delicious - so much so that you really can't fathom just how good it it is until you try it for yourself. The tips below will help you to put this under-five-ingredient and absolutely to die for appetizer together with ease. To make a stellar Pan con Tomate, be sure to get yourself some really fantastic bread. I think that a large, round peasant loaf sliced about a 1/2 inch thick is the best bet because it toasts up very light and easy to bite while the crust maintains its crispiness. We like to use Eli's brand. Finally, the recipe hinges on having very ripe beefsteak tomatoes. Really any type of larger tomato will do, but beefsteaks have been especially flavorful this summer. A nice drizzle of good quality, fruity extra virgin olive oil is also important, as is a dusting of kosher salt. Serve up these toasty slices of garlic and tomato-ey goodness and watch as your guests gobble them up. It's hard to say just what makes these so good, but the fact that they are incredibly easy to makes them all the more wonderful. I hope you enjoy this dish as well as all the compliments it's sure to get you! Over a box or handheld grater set over a bowl, rub tomato halves until all the pulp is grated and only the skin remains. Lightly toast the slices of bread until crispy and slightly golden. Rub the tops of each slice with a half clove of garlic. Press hard to be sure the garlic is transferred onto the entire surface of each slice (the crispiness of the bread will aid in the transfer). Next, drizzle slices with Extra Virgin Olive Oil. 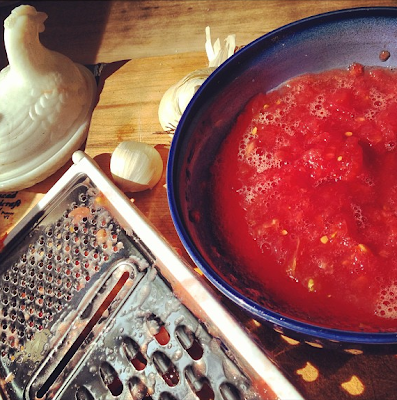 Liberally spoon tomato pulp over toasts and sprinkle with kosher salt. Serve immediately and enjoy! Don't you just love it when things are simple? Today's post is about an absurdly easy yet show-stopping side that will have your guests smiling in no time. Corn on the Cob with Garlic Jalapeño Lime Butter and Queso Fresco is really as easy as mixing up a few ingredients and then boiling (or grilling) one of the season's best veggies - sweet summer corn. The inspiration for this recipe came to me years ago while I was watching an episode of Boy Meets Grill, one of Bobby Flay's Food Network shows. Bobby mixed up something quite like today's Garlic, Lime, and Jalapeño Butter for corn - which of course he grilled. Ever since then, I've been making this amazingly easy and flavor-packed compound butter each year using my own favorite ingredients and proportions. Honestly, I have yet to find a guest who doesn't love it, and it's an easy way to deliver major wow factor with almost no effort! I personally prefer the ease of quickly boiling corn, but you can certainly grill it as Flay recommends. Up to you! Check out his version HERE. In general, compound butters are a great make-ahead way to jazz up both proteins and vegetables. In fact, you may also want to check out our Meyer Lemon Herb Butter for Lamb HERE. 1. First, make the Butter. In a small bowl or mug, mix together sliced butter at room temperature with the first four ingredients until fully incorporated. Spoon onto a square of plastic wrap and shape into a a baton shape. Roll plastic over the butte carefully and seal on each end - like a party favor. Place in the freezer for 5 minutes or the refrigerator for 20. Before using, slice butter into pats and bring to room temperature. 2. About 20 minutes before you are ready to serve the dish, set a very large pot of water to boil. Once boiling, add the ears of Corn and cook until tender - about 5 minutes. Remove ears of corn to a platter and top with slices of Garlic Jalapeño Lime Butter (you will likely have some butter leftover). My Vegetable obsession of the moment? I can't get enough of these guys, and with varieties as beautiful as this, who can blame me? 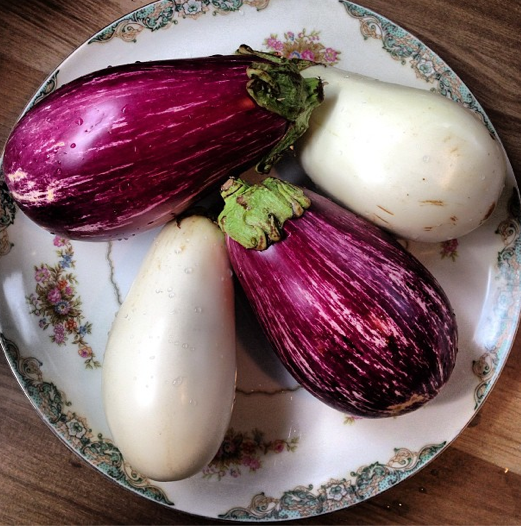 The even better news is that Eggplants are in season now through early fall and ready to be loved. I already shared a Marinated Eggplant appetizer very early this summer, but I didn't see the harm in attempting another version, especially because I also happened to have a fierce craving for it! There's just something sublime about thin slices of roasted and then marinated Eggplant on a piece of pleasantly crusty bread. I don't know about you, but I call that the perfect snack. 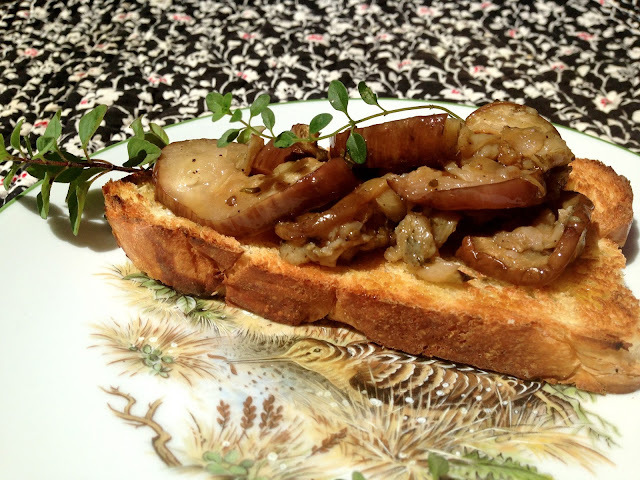 Today's Marinated Eggplant is a bit milder than our bold, lemony, and spicy version HERE. Additionally, Marinated Eggplant is a great vehicle for fresh herbs (which I happen to have growing like wildfire in my garden). Using White Balsamic Vinegar adds a mild yet sweet tang to this super simple starter. Make this in advance and store for several days in the fridge. The mixture even gets better with time, and you can be ready with an elegant snack at a moment's notice. Also - If you use the basic Eggplant baking method below, you can certainly adapt your marinade to your tastes and do plenty of experimenting with whatever ingredients you have on hand. 1. 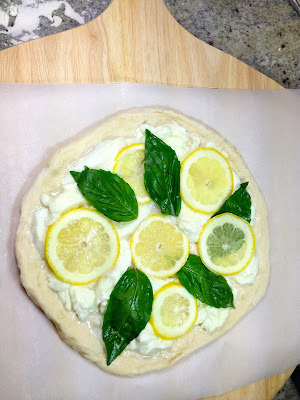 Preheat oven to 425 and set aside two large baking sheets. 2. Cut each Eggplant down the middle lengthwise and cut each half horizontally to form half moons. 3. Lay Eggplant slices on the baking sheets and drizzle with Extra Virgin Olive Oil and Sprinkle with Kosher Salt and an Black Pepper. Once oven has come to temperature place baking sheets in for 15-17 minutes until the eggplant is tender. If it looks dry, don't worry as the marinade will take care of that. 4. While Eggplant is baking, warm 2 Tablespoons of Extra Virgin Olive Oil in a small pan over medium-low heat. Add the two Cloves of crushed Garlic and cook until they begin to become slightly golden, about 3 minutes. Turn off the flame and allow the oil to cool a few minutes before adding the minced Oregano and Thyme. Add the 2 Tablespoons of White Balsamic Vinegar to the pan and set aside. 5. When Eggplant is finished baking, scrape the slices carefully into a large bowl. Pour the contents of the pan into it and toss gently so slices are fully coated. Allow to cook and then store refrigerated up to 4 days. Serve over crusty bread! Enjoy! Taco Night is a favorite around here, and tonight, we're making good old-fashioned Beef Tacos. Nope, they'll be no fancy sauces or exotic toppings, just cheese, lettuce, tomato, and a dollop of sour cream. But what can you do to lend some extra special flavor to a comfortable old favorite? 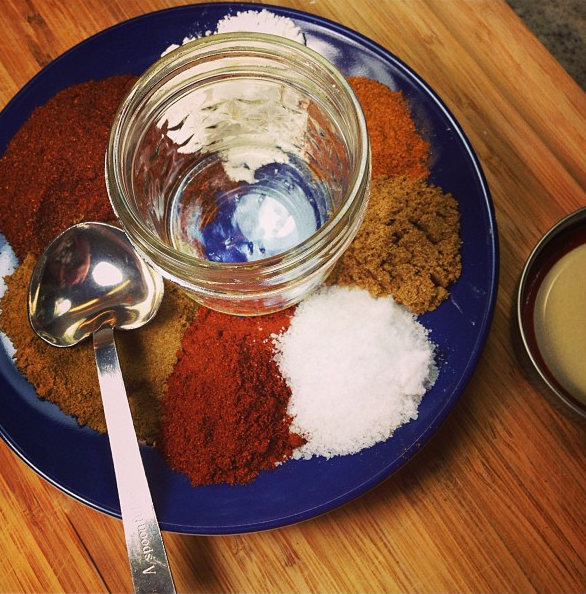 The answer is simple - Homemade Taco Seasoning. In today's Test Kitchen, we'll be trying out Alton Brown's Taco Potion #19. Potion... oooh, I like it. My dad named me after a TV witch (a cute and nice witch, mind you) so I guess it all makes sense. Alton's recipe is great because the spices required are pretty easy to find. In fact, I happened to have them all in my pantry. Finally, my spice hoarding pays off. In just under 5 minutes, we were left with a batch of flavorful Taco Seasoning that will last a while. My Plan? Jar it up and be ready for our next lazy taco night. Idea: This mix, in a cute mini-mason jar, would make a great hostess gift or party favor. Super easy. Use this Taco Seasoning on any protein, even vegetarian meat substitutes. Flavor-wise, Taco Potion #19 is just plain good! It actually tastes like a much, much better version of the grocery store stuff in the little paper packets. As a bonus, we know exactly what's in it, as the recipe includes all ingredients that we can spell and of course, no creepy chemical additions. Also, the salinity is very balanced - it won't give you a sodium hangover. You could even use this blend as a jumping off point for your own proprietary Taco Potion. Upon seeing the results, my husband observed (seemingly to his dismay?) that unlike the store-bought version, this mix did not impart a bright orange coloring to our beef. "Good. Your food should not be artificially orange," I responded. "But what about about delicious Kraft Mac 'n Cheese?." My clever guy has a point! We'll look the other way on that guilty pleasure. Yield: Approx 3 ounces - Makes enough for at least 8 servings of Tacos. Save the leftovers in an airtight jar for up to 1 month. Mix to combine and store in an airtight container. 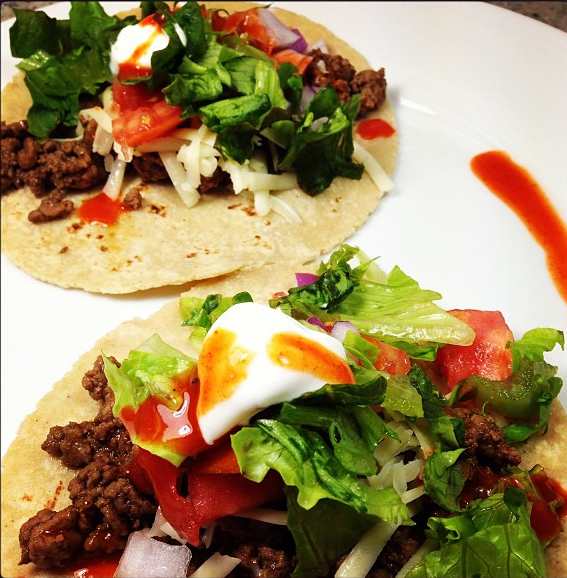 To use your Taco Seasoning, add 1/4 cup of liquid to your pan of fully browned and cooked protein. You can opt for Water or better yet, Beer (thanks for my friend Marina for that idea). Stir in the Seasoning. Roughly 2 Tablespoons per pound of Protein will do, but you can use your judgment. Allow liquid to evaporate a bit and stir. Serve right away on your favorite taco! My husband keeps talking about us only having four more weeks of summer. He's said it at least three times in as many days. It's driving me crazy, actually. I stomp my foot at him in protest (he loves when I do that) and tell him to stop being such an alarmist. Come on now, people - summer doesn't actually end on Labor Day! It's quite a rare occurrence that my other half takes the glass half empty role. I'm usually the one with the pessimistic outlook (or as I like to call it, "being a realist"), but when it comes to summer, my favorite season of them all, I am in full-on denial. Loath to admit it though I may be, I will grant him that summer is going way too fast. So until all that glorious sun yields to the chill of Autumn, I'll be doing all I can to live in moment. That's right, I will relish the feeling of my toes wiggling freely in all their flip-flopped glory as I head out into the balmy air in full frolic mode every chance I get. Clearly, I also will be eating every fresh Tomato and ear of Corn I can get my hands on. For me, there is truly only one sandwich that embodies the essence of summer and everything simple and wonderful about the season -- the much talked about, much loved Tomato and Mayonnaise Sandwich. (Check out a few of my favorite meditations on the subject HERE, HERE and HERE). Today, we'll be paying homage to this seasonal icon with our own take on the classic. We add a semi-controversial lettuce leaf for texture, and, though regular Mayo works really well (Hellman's full-fat, please! ), we take ours up a notch with lots of finely minced Parsley and a touch of Oregano from my garden and, here's the topper - a game-changing sprinkle of Lemon Zest. Make this satisfying sandwich and extend your summer that much longer. Good Quality Toasted White Bread - I know, I know, but if ever you should return to White Bread, it's here. 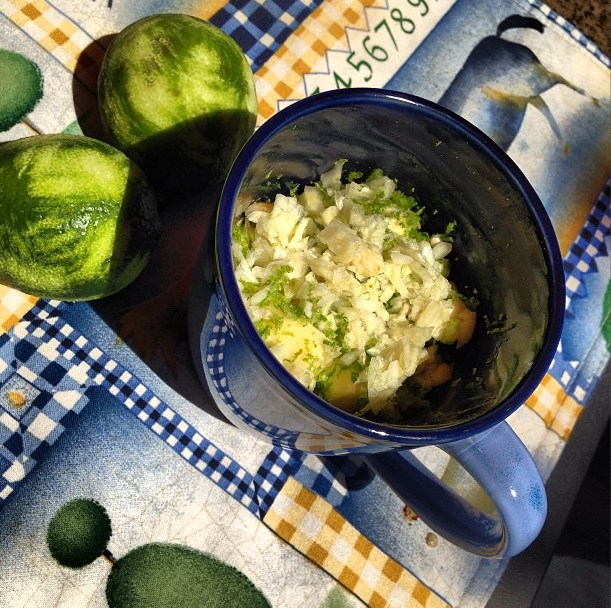 Mix the Herb Mayonnaise ingredients together in a small bowl. 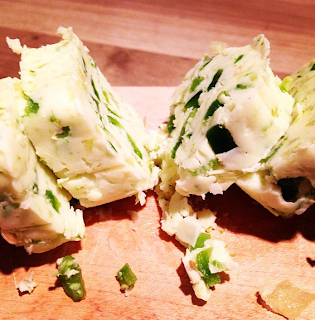 Spread one side of the bread with a generous amount of Herb Mayonnaise. On the other piece of Bread, lay down a Lettuce Leaf and two or more slices of Tomato. Sprinkle Tomato with a good dose of Salt and lots of Black Pepper. Place the Mayonnaise half on top and close up the sandwich. Enjoy! Fact: Salads really do run the gamut from smashing to snore-worthy. Fact: Bread makes everything better. Especially Salads. Fact: Grilled Bread with fruity Olive Oil, sprinkled with Salt, Pepper, and Smokey Paprika makes things infinitely better. 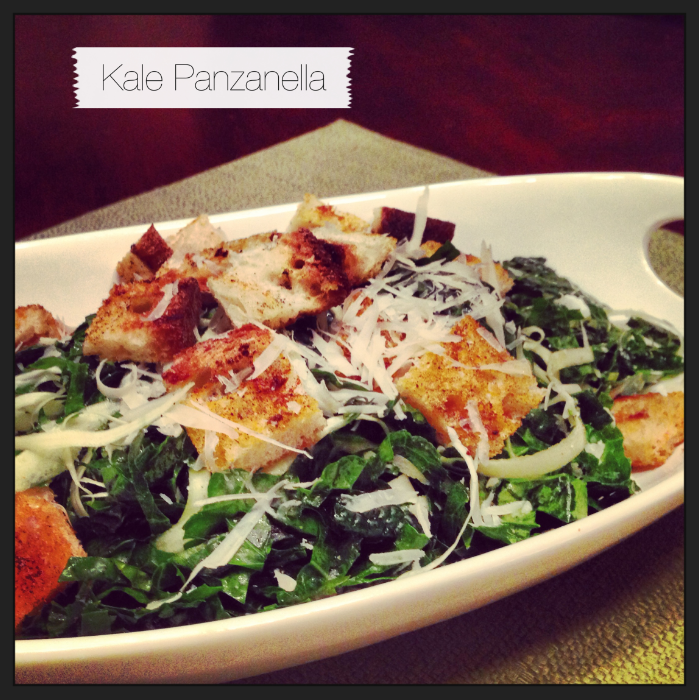 Myth: Kale is always tough and unappealing if you don't cook it. Ho-ly-smokes. Make our raw Kale & Parsnip Salad and dispel the myth that Kale Must be cooked to be amazing. Not so! With the right amount of loving care, some lemon juice (or vinegar-acid is the key to softening up Kale) and a little time + a tenderizing leaf massage, Kale can be served au natural, no heat required. Slice up those sturdy leaves nice and thin, though. Now - how to make our little Kale Ribbons sing? That's easy. We're serving them in a Panzanella (aka Tuscan Bread Salad - see our last Panzanella HERE) with shavings of sweet Parsnips and homemade grilled Croutons made from hearty Peasant Bread that's been jazzed up with Hot Smoked Spanish Paprika. 1.Pile Kale Leaves together and slice horizontally into very thin ribbons. 2. Add Kale Ribbons to a large Ziploc Bag. 4. Combine all the dressing ingredients in a small bowl. to distribute the dressing and rub it all into the Kale. 6. Allow the bag to sit at room temperature for at least a half an hour, squeezing and shaking it occasionally. 7. Meanwhile, heat up a grill or grill pan over a very high flame. Lay Bread Slices on a surface and brush them one side with Olive Oil. Now sprinkle with Kosher Salt, Pepper, and an ample hit of Hot Smoked Spanish Paprika. (Don't skimp on the Salt, either). 8. Place Bread slices on the grill or grill pan and cook for 3 minutes on one side until grill marks appear. and cook another 1 minute. 10. Allow the Bread to cool and then slice into bite-sized chunks. Plate Kale and Parsnip Ribbons and lightly toss with Chunks of Bread. To finish, sprinkle with optional grated Parmigiana.